Front width: 28 1/2 in. Rear width: 23 1/2 in. A fireplace without a fireplace grate turns into a major problem in no time. Fortunately for you, the G1000 Series Fireplace Grate helps with the functionality of your fireplace while also adding to the appeal of it. The cast iron design not only gives a vintage look to your hearth, it also ensures you that this grate will last for years to come. The G1000 Series Fireplace Grate lifts up the firewood, giving your fire smooth ventilation and a hot, long lasting fire. What is the overall height of this grate at the back and at the front? Per the manufacturer, this grate has legs that measure approximately 4 inches tall. The basket itself is another 2.5" in the front and 1.5" in the back. These measurements are approximate and can vary by casting. What is the difference between cast iron grates and the stainless steel? Cast iron grates are generally not as durable as diamond or stainless steel grates. The metal is inherently more brittle and can crack after a short time of use under high temperatures. The grade of iron can also make a difference. Many cast iron grates are made overseas out of very porous metal that degrades quickly. Diamond steel and stainless steel grates are much stronger and can last for many seasons of hard use. These grates do not radiate heat as well as the cast iron models, but the extra longevity of the grate is a good payoff. reliable and heavy duty for sure. Wish I had checked the height of the legs better. It fits in the fireplace but I should have gotten one shorter for a better fit for logs. That being said, it will certainly last the rest of my life! Fits our fireplace perfectly. Free shipping an important plus; it's very heavy! I was looking for a grate that would last a long time. This unit is very heavy and well made. I am very happy with my purchase. This was a gift for my sister, and she reports that it's heavy and sturdy. Our previous basket grate lasted almost 20 years in a much-used fireplace. 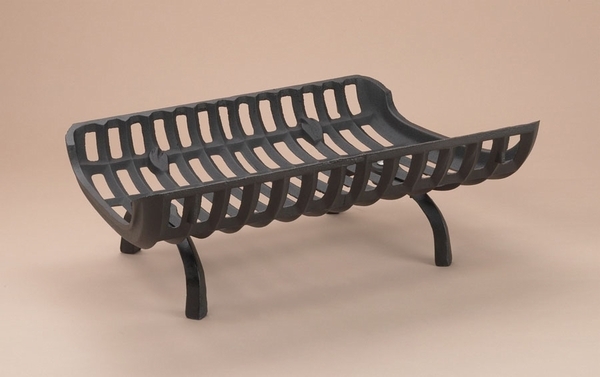 This grate features smaller holes for retaining hot coals longer and high profile legs which allow easy cleaning of ashes below, not to mention the pleasing appearance. A great product. Just love it; best grate I have had because of great air flow due to height of the legs. When needed I will buy another one.Love it!! This grate is the best I ever saw. It is heavy,closed enough to hold coals, high enough to get air, holds fire well, perfect.